It's not surprising that having a father who played soccer at the University of Wisconsin - Milwaukee and then had a brief stint with the Milwaukee Wave on the professional level, that his twin sons would also take up the game and excel during their careers. But that is exactly what Andrew and Austen Schweinert did, as they followed in the footsteps of their father, Peter, who played at UWM (1984-88), was named co-captain and earned all-conference honors and then played 36 games with the Wave in 1989-90 season. Both players always had a ball around because of their father and they played their first organized soccer when they were 4 years old in a rec league. And they each had some interesting ideas on why they liked the game. "I like being part of the team. I like the idea that you really have to earn your points," Andrew said. "Basketball and football are high-scoring games. In soccer you really have to earn your goals. It feels good to do something as a team and win. And my dad really pushed me in soccer. I'm glad that he pushed me to try soccer and I just loved it." Austen had an interesting reason. "I like the fact that you use your feet," he said. All the other sports are just hand and eye coordination. Playing with my feet is something I love to do. I was a pretty hyper kid when I was younger. I was just running around. Being with Andrew we're super competitive and we'd play against each other all the time." Photo by Alan Herzberg, SportsPhotos LLC --- Senior Andrew Schweinert wins a battle for a loose ball against Marquette. Andrew, a midfielder, runs the show for the Lancers, setting up the attackers and directing the defenders. 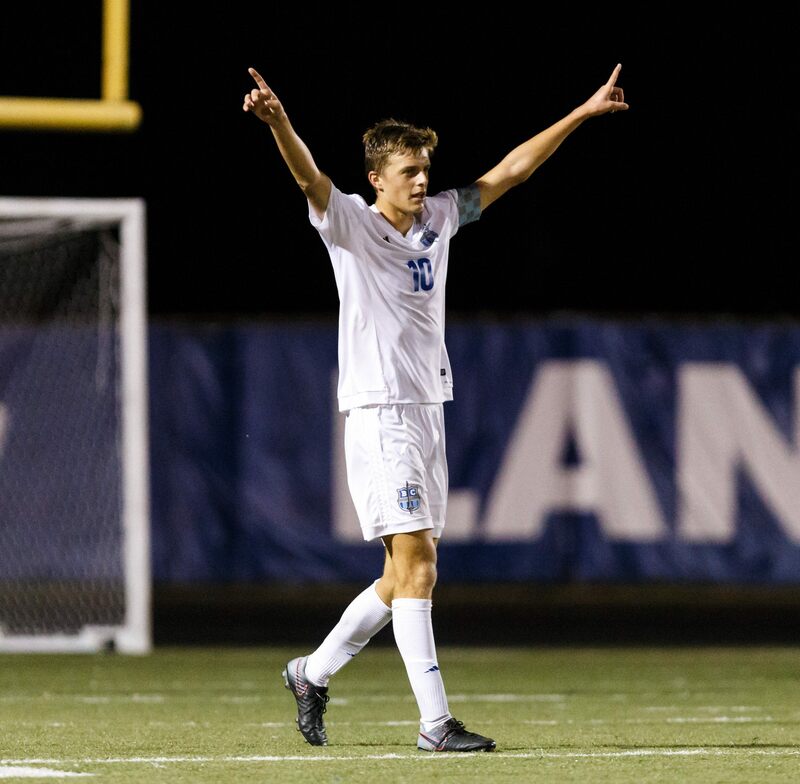 Now the Schweinerts and their Brookfield Central soccer teammates need two sectional wins to make their second straight trip to the WIAA State Tournament. After going 3-2-2 and tying for third in the Greater Metro Conference as freshman, the Lancers lost seven seniors and finished seventh (1-5-1). But last year they bounced back (14-2-5 overall) and finished undefeated (4-0-3) and tied for second in the GMC and eventually made their way to state, where they lost to eventual state champ Marquette, 3-0, in the first round. Austen, who earned GMC honorable mention honors his first two years, and Andrew were named to the All-GMC first team last year. Central coach Dan Makal knew he had something special with the Schweinerts and teammate Alex Mirsberger who was featured in Preps2Pros.net earlier this fall (http://preps2pros.net/2017/09/14/chip-on-his-shoulder-has-keyed-lancers-alex-mirsberger/). "As they started getting older, we started graduating some of our guys," Makal said. "We were a really young team and they were asked to play a lot of minutes. With Alex Mirsberger too, those three really had the varsity experience. They played almost every minute for four years." As a midfielder, Andrew has a lot of responsibility - setting up the attackers and being the first line of defenders. "My goal is to get the ball to him (Austen) and he scores all the goals," Andrew said, while laughing. "I feel I have to be a vocal leader, I have to direct players in front of me to help defensively, win balls for our team defensively and then start our attack going forward." Makal talked about his strong points. As they started getting older, we started graduating some of our guys. We were a really young team and they were asked to play a lot of minutes.With Alex Mirsberger too, those three really had the varsity experience. They played almost every minute for four years. "His rhythm (on the game flow) and balance. He does the nebulous stuff," Makal said of Andrew, who has already accepted a scholarship to Loyola University. "He kind of makes us click. He gets the ball and he can choose where it goes - how we go about and attack. "It takes a lot of patience, a lot of thought. If there is a situation where we are attacking a bunch, every good band has a bass and a drummer and they're going to have to listen to each other. They're the core of the rhythm section. Andrew feeds off the back line, feels what happens back there, releasing some pressure. He'll also look to put defensive situations out before they get to our back line. He's the first preliminary line before the defenders. Even though we defend with everybody, that's really his role." 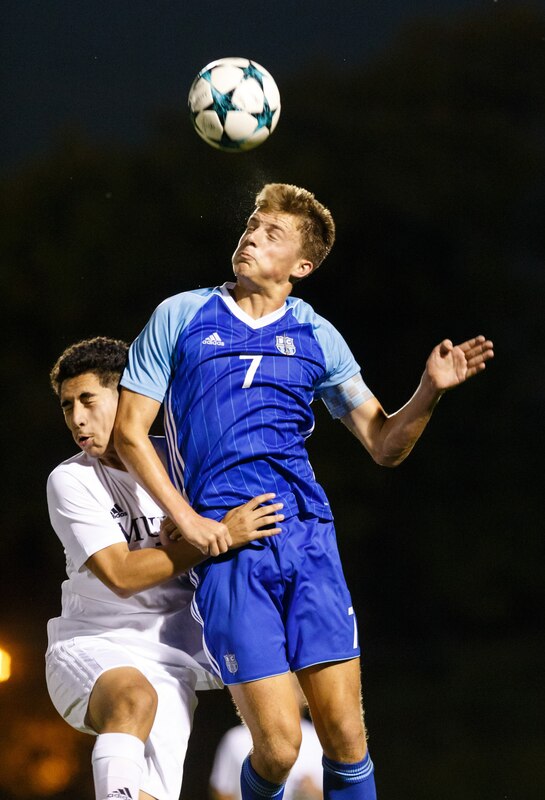 Photo by Al Herzberg, SportsPhotos --- Senior forward Austen Schweinert led the Brookfield Central offense with 18 goals in only 14 games during the regular season. Austen, who has 18 goals, gets more of the headlines. "He's an attacker. His ability is to get on the ball. He's a playmaker," Makal said. "We ask him to be athletic; it's good that he has that quality. Being athletic is a plus and it helps Austen's ability to take someone on. "There are a lot of players who are just soccer players, they are not multi-faceted. He has that ability to take someone on. Being athletic is a plus. He can pass the ball, get the ball back and score a goal." Austen knows what is expected of him. "I love scoring and I love to score as many goals as I can," he said. "I'm also the creator and I want to help my teammates score goals if I can. (When I do score) the feeling is indescribable. Obviously, nothing beats scoring other than winning." Both players also know their strong points and the best way to help their team be successful. "I'm a really technical player," Andrew said. "I can see the field really well. I can make good passes, help my teammates out. "I feel that I'm a pretty good defender, like a two-way player. It helps that I'm a pretty big guy (6-feet). I like applying a lot of pressure on my first touch, connecting on passes. That's my strength." Austen knows his job is to put the ball in the net. "One of them (his strengths) is definitely scoring," he said. "I'm pretty good at finishing. I'm pretty good at dribbling. I love dribbling, actually. Sometimes they get mad at me for doing too much (dribbling). Personally I'm not good at defending. (Andrew) is a much better defender. But attacking-wise, I feel I'm very, very good." Both players know they have things they can get better at. Andrew needs to work on his footwork and acceleration. Austen feels he is too much of a one-way player and wants to work on his timing, explosiveness off the ball and his defensive work. Both players, plus Mirsberger are team captains, something that is important to them. "I think it's huge. I think being a leader is a big honor," Andrew said. "They look up to me. I have to be a good role model to them. It's something I want to do, both vocally and leading by example. "Given my position on the field, I have to be a vocal leader - bringing guys up when they fail to do something, encouraging them to do better and then praising them when they do well. In a game - making a tackle and making a pass - I feel I can lift guys up that way." Austen pointed out there are two freshmen and a handful of sophomores on the team. "Especially for Andrew and I with it being our last year, we have to lead these guys. They're the future of our program and we want to give them a heads start on other teams who might not have freshmen. I think it's important that we have to show them the ropes, what it's like to play here. I definitely think Andrew is more of a vocal leader than I am, I definitely like to lead by example. Both talked about growing up being twins and the natural rivalry. "You can't really avoid it. The guy looks just like you," Andrew laughed. "It's like looking in a mirror. We push each other to get better. Both want to be the best we can be. We push each other to be better than the day before. There is always a natural rivalry. For example, his favorite team is Arsenal and mine is Chelsea." "He's pushed me harder," Austen added. "The competition is great. I probably wouldn't be where I am today without the competition between us." Both players looked back as their varsity career was coming to a close. "This is a super important fourth year. It's crazy how time flies," Andrew said. "I remember every senior saying just wait until you are in our shoes, it just goes so fast. It's finally playoff time our senior year. I loved my time playing with BC and I just want it to go as far as possible." "I'd love to have my season end with a state championship trophy," he said. "I want to go as far as we can. It's scary how fast time has gone. Looking back it's been really great, but it would be a lot nicer if we got the trophy." Then one final friendly shot when I laughed and asked who was better looking. "Me," said Andrew. I'm obviously going to say myself," Austen said. "And the girls are going to say me as well. But he can say what he wants." WHAT DO YOU WANT TO DO IN THE FUTURE: Attend Loyola University on a soccer scholarship and study business. WHAT DO YOU WANT TO DO IN THE FUTURE: Attend college on a soccer scholarship and study business.